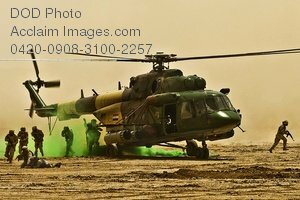 Description: Free, public domain image: Iraqi Soldiers Exiting an Iraqi Air Force Helicopter. Iraqi Soldiers exit an Iraqi Air Force helicopter during the Combined Arms Live Fire Exercise in the Maysan province April 19. The training event displayed the Iraqi military's and Long Knife Brigade's cooperation in missions and sharing of resources. (U.S. Army photo by Spc. Creighton Holub.